Everyone is trapped in today’s governance system, which is secular, corrupt, greedy, blinded by caste-based politics and unpatriotic. The brilliant concept of the ‘Hindu Rashtra’ has been covered by pollution caused by this governance system. Efforts are being made to forget the ‘Hindavi Swarajya (Hindu self-rule)’, meaning, the ‘Hindu Rashtra’ established by Chhatrapati Shivaji Maharaj, and paint it green under the pretext that it promoted Sarvadharmasamabhav (Where all religions are respected equally). Despite the existence of Ramrajya in this very land, meaning, existence of the ‘Hindu Rashtra’, it is being derided as a myth. A deliberate attempt is being made spread the notion that a ‘Hindu Rashtra’ means communalism; however, this is false propaganda. By accepting the ‘Hindu Rashtra’ of Chhatrapati Shivaji Maharaj as an ideal, a prosperous, cultured ‘Hindu Rashtra’ that will preserve the spiritual heritage will be established by 2023 on the lines of Ramrajya. Outwardly, there is nothing happening that will give hope of establishing the ‘Hindu Rashtra’ and yet, to speak about the ‘Hindu Rashtra’ with such conviction may seem an exaggeration to some people; however, Saints have already sensed the ensuing prosperous ‘Hindu Rashtra’. What is known as ‘making of a Nation’ in modern language, has been called ‘Reinstatement of Dharma’ in Sanskrut scriptures. Such a reinstatement of Dharma, meaning, establishment of the ‘Hindu Rashtra’ will be beneficial from every perspective in today’s situation. 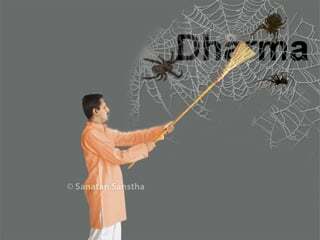 To make efforts in this direction is the spiritual practice or duty of every Hindu as defined by Dharma. 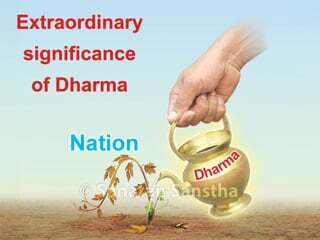 Today, reinstatement of Dharma means creation of an ideal system of governance based on Dharma. Brahmatej (Radiance of a Brahman) and Kshatratej (Radiance of a Kshatriya) are the two aspects necessary for reinstatement of Dharma. On the strength of sadhana, most Saints and spiritual organisations like Sanatan Sanstha are nurturing spiritual strength, that is, Brahmatej; whereas, to change the pathetic state of the Nation, nationalist and devout organisations, periodicals and intellectuals are actively working at the physical, psychological and intellectual levels respectively. They are all nurturing Kshatratej. The nature of this mission is given ahead. Taking actual physical action for reinstatement of Dharma, for example, preventing harm to Dharma, organising rallies against harm to Dharma etc. As per the present times, this aspect has 10% importance. As per the principle ‘Unless national and religious feelings are awakened, action does not take place’, Hindus in general should be educated on the concept of reinstatement of Dharma and be inspired to become proactive for this noble cause, for example, giving educative articles in newspapers, periodicals etc., giving speeches etc. As per the present times, this too has 10% importance. Giving direction to the Hindu society for reinstatement of Dharma, for example, presenting scholarly analysis of threats to Hindus, providing intellectual strength to organisations. As per the present times, this aspect has 10% importance. Performing spiritual practice to be able to provide spiritual strength to the physical, psychological and intellectual mission for reinstatement of Dharma, for example, to chant or perform Yadnyas (Sacrificial fires) for fulfilment of a task. As per the present times, this aspect has 70% importance. In addition to the Guru-disciple tradition and spiritual sects, every Hindu should perform the task of Kshatratej (at the physical, psychological &amp; intellectual levels) and Brahmatej (at the spiritual level) as per his ability for reinstatement of Dharmaand nurture the Guru-disciple tradition. O Hindus ! 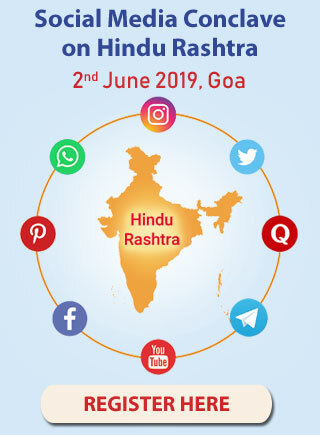 From this year’s Gurupournima, be proactive towards reinstatement of Dharma and be an integral part of the historic event of establishing the ‘Hindu Rashtra’. 1. 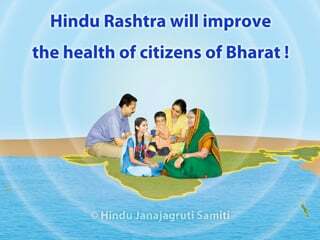 Actively participate in the programmes of institutions, organisations and sects that are active for establishing the ‘Hindu Rashtra’. Spare at least an hour every day for this. 2. 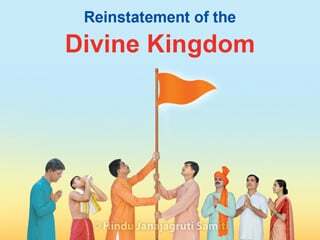 Create awareness among the people about the need for establishing the ‘Hindu Rashtra’ with the help of this Holy text. 3. 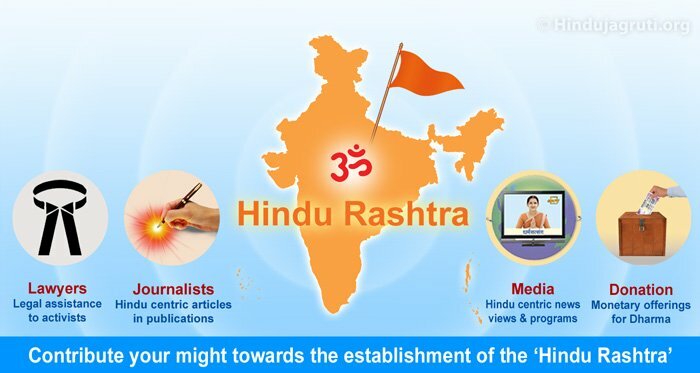 Disseminate the thought of establishing the ‘Hindu Rashtra’ through media, websites etc. 4. Provide financial assistance as per your ability to people and organisations that are active for establishing the ‘Hindu Rashtra’. A. Teachers can celebrate smrutidin (Remembrance day) of the national heroes such as Chhatrapati Shivaji Maharaj, Swatantryaveer Savarkar etc. in schools so as to propagate the concept of the ‘Hindu Rashtra’. B. 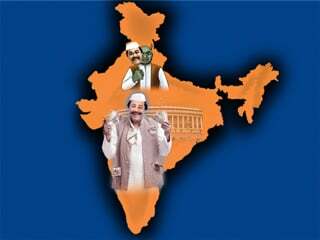 Lawyers can provide free legal assistance to those who are active for establishing the ‘Hindu Rashtra’. C. Journalists can write for newspapers etc., elucidating the importance of establishing the ‘Hindu Rashtra’. D. Employees in Government establishments can study the shortcomings in the prevalent administrative systems and identify remedial measures to eliminate such short-comings in the ‘Hindu Rashtra’ that will be based on the principles of Dharma. 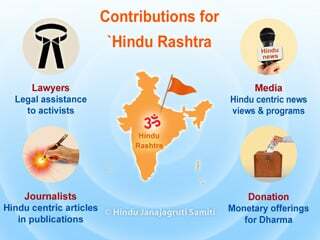 E. Traders can give financial aid (or in kind) every month to people or organisations active for establishing the ‘Hindu Rashtra’. F. Libraries can make available books that propagate the thought of establishing the ‘Hindu Rashtra’ and thus educate people. 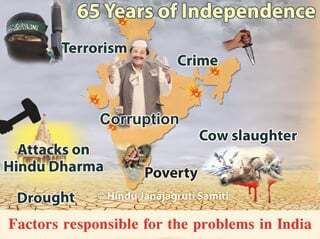 G. Hindu organisations can organise programmes for creating awareness about establishing the ‘Hindu Rashtra’, as also combating ‘Love Jihad’, purifying the converted Hindus, protecting cows, purifying River Ganga etc. H. Schools where education on Vedasis being imparted and priests should perform Yadnyas to bestow spiritual strength on those working for establishing the ‘Hindu Rashtra’. 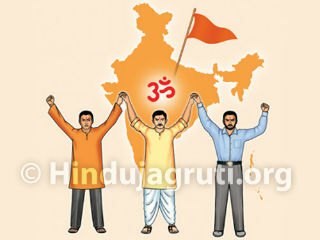 I. Saints and spiritual sects can pray and chant for some time everyday for establishing the ‘Hindu Rashtra’. Full moon day of the month of Āshāḍha, also called Vyās Pourṇima after Sage Vyās who is considered ādya, meaning the first Guru.